A Sittingbourne man who was beaten with a plank by two Asian men was himself hauled before the courts for racially aggravated assault. 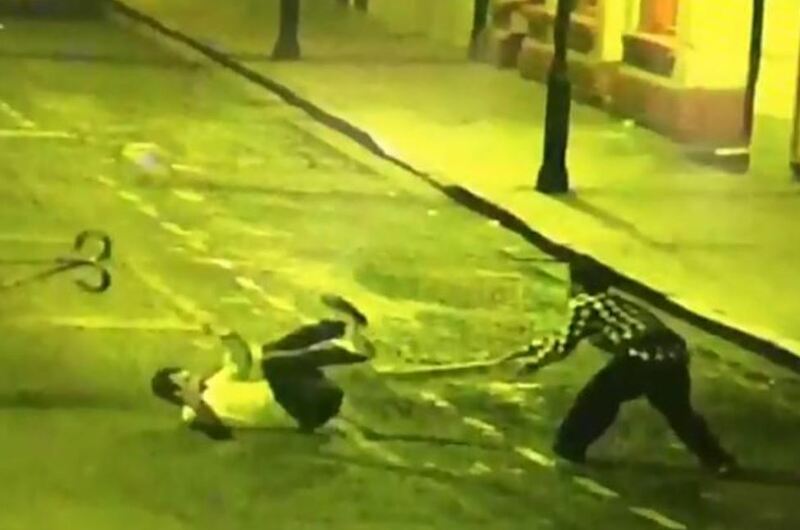 Darren White posted footage on his Twitter account of the pair attacking him with a wooden plank as he fled through the town’s high street. The 32-year-old then tweeted the former English Defence League leader Tommy Robinson, alerting him to the case. “I got beat with wood and pole and I may be going prison for racial aggravated behaviour,” he posted. The video shows White being chased past the New Century Cinema before being struck four times with the plank as he entered the high street. White, of Doubleday Drive, Bapchild, went on to tweet “got court today as I said arrest the ****ing Muslims so up for section 5 (sic)”. He was ordered to pay £1,925 in fines for assaulting the policemen and another £300 for having the drug. However, White was found not guilty of racially aggravated behaviour. The Asian men shown in the video initially denied any wrongdoing. But Muhammad Ahad, 24, of Kingston Road, Epsom, and Sarwar Hussain, 25, of Palmerston Road, Chatham, changed their pleas to guilty in court and will be sentenced later this month.